CIMSEC sat down with Captain Mark Vandroff to solicit his expert insight into the complex world of acquisition and the future of the U.S. Navy’s destroyers. CAPT Vandroff is the Program Manager of the U.S. Navy’s DDG 51 program, the Arleigh Burke-class destroyer, which is the most numerous warship in the U.S. Navy. 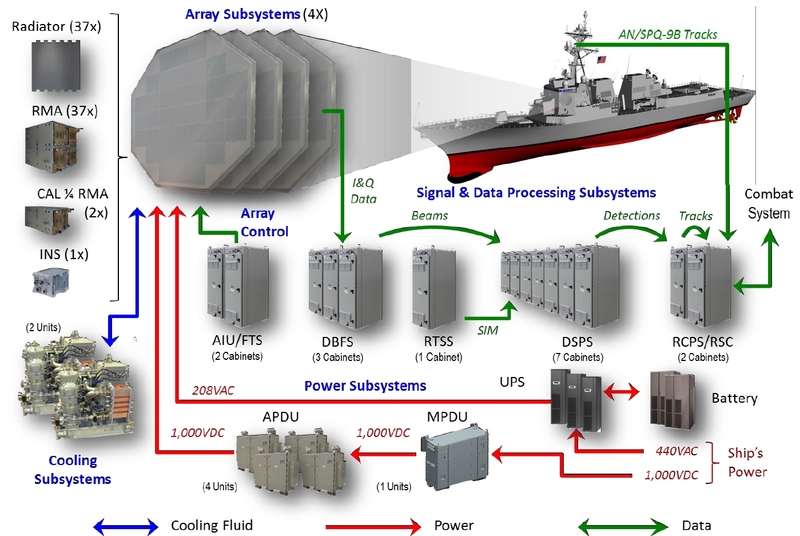 In the first part of this two part interview series, CAPT Vandroff discusses the capability offered by the SPY-6 Air and Missile Defense Radar, the differences in warship design between the currently serving Flight IIA and upcoming Flight III variants, and the U.S. Navy’s ongoing Future Surface Combatant Study. This is a big year for your program. 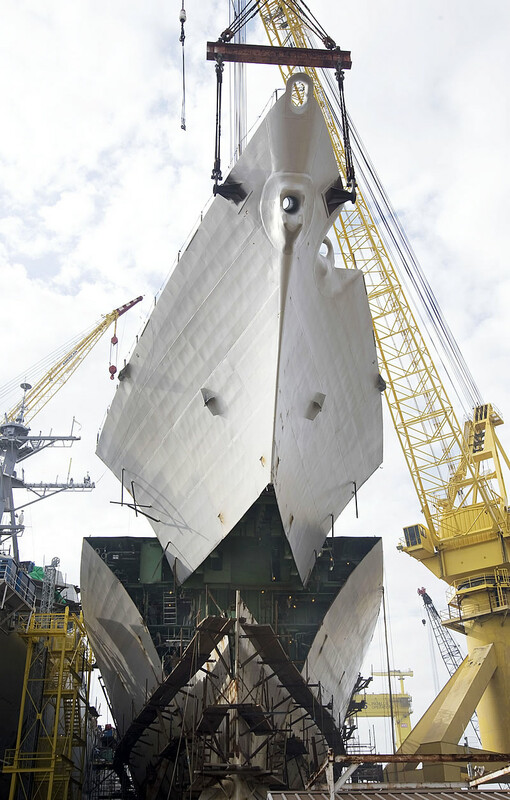 It is the fiscal year where you begin procuring the new Flight III destroyers. Can you talk about the differences from the Flight IIA to the Flight III? The raison d’etre of Flight III is fielding AMDR. 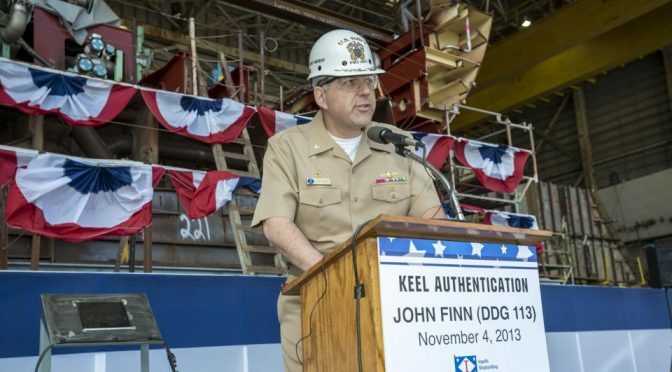 SPY 6 is the designation for that radar as it goes on a DDG 51. That radar program may yield other radar technologies because it is very exciting technology. The Flight III gets the AMDR SPY-6 radar onto a DDG 51 platform, replacing the SPY-1 radar currently in use. That radar is a significant, multi-generational leap forward in radar technology. In the same space and roughly twice as much power, it produces over 35 times as much power out. Between the power efficiency and sensitivity of the radar, it is a huge step forward. It also includes other very desirable radar features such as a much improved resistance to advanced counter-radar jamming techniques and the ability to integrate seamlessly through a radar system controller, not only the S-Band SPY-6, but also an additional separate frequency input. It can use the multi-frequency input for better targeting, and a lot of good things happen for targeting and your reaction time by synthesizing multi-band input. We hook up the SPY-6 AMDR, which is a S-BAND radar, with the existing and already planned for DDG 51 X-Band emitter AN/SPQ-9B to get the full radar suite for the Flight III. If it were all that simple I would tell you to talk to my colleague, CAPT Seiko Okano, she’s the SPY-6 program manager. I would not have to do very much and she would just deliver me a different radar. But the radar requires us to do things to the ship to be able to accommodate it. The radar takes about twice as much power. We had to take the ship from three, 3 megawatt (MW) generators to three, 4 MW generators because we never have three on at one time for purposes of redundancy. We always calculate what would happen if you had to run on two of the three. When we calculate what our battle loads are and can we handle them, we always calculate to whether we can handle them with two of the three generators if one of them is down for whatever reason. That’s how you design a redundant warship. So when we up the power out of our generators to four megawatts we run into our first physics challenge. When we up the power we have to do one of two things, either increase the voltage or increase the current. At a certain level of current, it becomes difficult and at times unsafe to run a certain amount of current through the kind of wiring we would put on a ship. With what we currently have, if we had to up the power anymore we would be hitting those limits. So we have to up the voltage, which is easily done. We’ve got 4160 volt power on aircraft carriers, on DDG-1000, so we had to implement that for Flight III. There’s a separate 4160 bus for powering the radar, and then we stepped down with transformers for our 450 loads that exist. That allows us to power the radar, and at the same time power the rest of the ship the way it is powered in a Flight IIA. That was the first change and we’ve done a lot of work to make sure that electric plant design will be safe, stable, redundant, and survivable in battle. That’s been the work of the last two or three years, and a lot of work is put into splitting those loads out.We have a 4160 distribution system with the existing 450 distribution system that we could do that with. That was the first ship side technical challenge that I would say now we’re pretty much through. The new generators, the four MW generators, have gone through their critical design review and they’re just now starting production. Flight III Electric Plant Concept. The next thing we needed to look at was actually powering the radar. The radar runs off 4160 converted 1000 volt DC to AC. 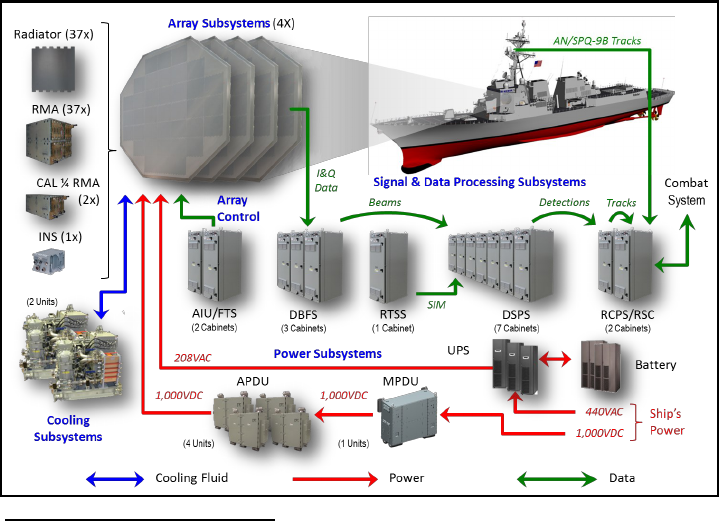 The equipment to convert that and condition it was similar to what DDG-1000 uses, they use that power conversion module on their SPY-3 radar. We competed, it was a full and open competition, we got many bids, and DRS (Diagnostic/Retrieval Systems, Inc) won the work. 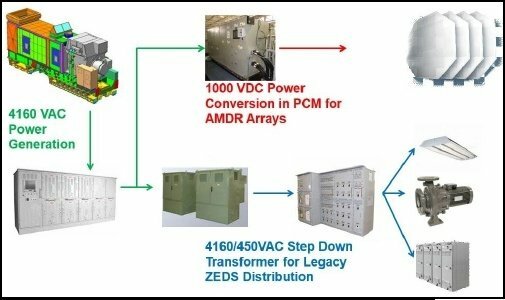 They came to us with a box that was based on their DDG-1000 design, but had a couple of generations of power monitoring and power conditioning improvement on top of that incorporating lessons learned from the commercial world. That’s been through its preliminary and critical design review and its gone into production now. That gets us power to the radar, and power to the electric grid. If you think about power what else does the radar need? The radar needs more cooling. A more powerful radar produces more heat. For reference, a refrigerating ton is the amount of cooling I would have if I rolled a ton of ice into this room and let it melt for 24 hours. A DDG 51 today has about 1000 tons of cooling. Once you install the SPY-6 you really need 1400-1500 tons of cooling. When we were starting the early preliminary design, NAVSEA already had an energy saving initiative. 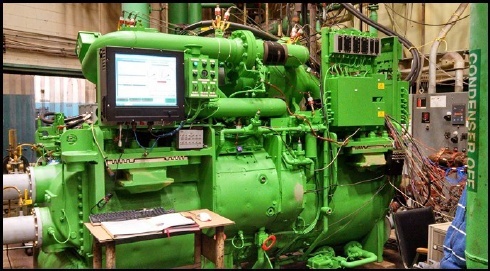 It was a plan to take the Navy standard 200 ton plants and equip them with a more fuel efficient compressor, and some other design improvements. All of that’s made by York Navy Systems in Pennsylvania that makes that standard 200 ton plant. NAVSEA works with them, and they are actually in the process now, and there’s a working prototype of the improved 200 ton plant that is putting out over 325 tons of cooling and it is just going through its equipment qualification to make sure the new machine will pass all the Navy standards for shock survivability. We are getting ready to put the initial orders for those to deliver to the Flight III because when you put five of those you get an excess of 1500, and that will give us more than enough cooling to accommodate the new cooling loads. So those have been the key components in changing the ship for the Flight III. Prototype HES/C 300 rton A/C chiller. In terms of weight, if you put everything that a SPY-6 uses and everything a SPY-1 uses on a scale they roughly balance. However, SPY-1 forms the signal in a signal generator and then transfers that up to the array, so that signal generator is lower in the ship. Because SPY-6 is an active array, the signal is generated on-array, so that means the arrays are heavier. Arrays go up high so that means the weight goes up high. If you are on a ship you are not crazy about high weight. You want to be like a running back, you want your weight low so it is hard to knock you over. The last thing we did is move some weight around in the ship. We thickened up the hull and the scantlings, which are the ribs of the hull. That offsets the high weight by putting extra weight low, and moves your center of gravity back down. The center of gravity of a Flight III will be roughly where the Flight IIA’s center of gravity is now. We are still concerned about things like performance for flight ops and maneuvering, and what that means for the pitch and roll in different sea states. We have the advantage of Naval Surface Warfare Center Carderock’s great new MASK tank where they can do all sorts of different sea states all in one tank. We have the scale model of the Flight III being built out at Carderock and that will go through all its tank testing with an idea to make sure that as we are designing the ship we know where we are for maneuvering the ship. Those are the big shipboard changes that facilitate the introduction of the radar. It is cool for me as the ship guy to talk about moving weight around to get good center of gravity, or getting the new electrical plant, but all that has to mean something to the warfighter. 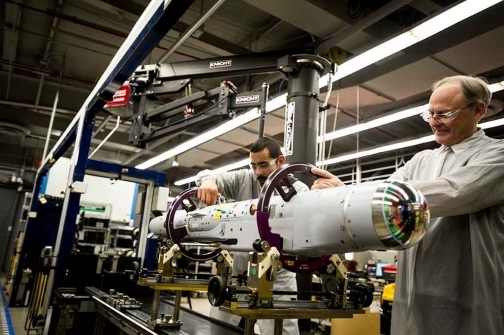 What the warfighter gets out of the Flight III is that improved radar performance from the new SPY-6 radar tied into the existing AN/SPQ-9 radar and those synthesized together for better performance in the atmospheric regime and the ballistic missile defense regime. It offers tremendous improvement in capability in both of those regimes. Because AMDR is such a tremendous increase in capability, how does this affect the DDG 51’s growth margins? That is one of the reasons we looked at things like the extra cooling and the extra power. If you look at where the Flight IIA is, the Flight IIA has about one and a half MW of service life power growth, and about 200 tons of cooling growth. If you added up every load on a Flight IIA today you would get something just over 4 MW of load, and if you put two 3 megawatt generators on the load together to power those four megawatts. You pay an efficiency penalty when you parallel two generators together, so two 3 megawatt generators gives about 5.8 MW of usable power and about 200 KW of the generators fighting themselves at peak. That is about one and a half MW to one and two thirds MW of margin on a IIA today. The Flight III will have a heavier load. A full battle load will be up over 5.5 MW, but we will be well over 7.5 MW when we put two four MW machines online together. We will have another two MW of power. The total cooling reserve will be about 200 refrigeration tons to 300 refrigeration tons. At this point some people usually ask is 2 MW enough when you look at directed energy weapons and railguns. I can tell you the Navy is reevaluating its historical standards for electrical growth in its future ship design. Will those historical standards be adequate for a future that includes railguns and directed energy? The Flight III will have as great or greater an ability to accommodate that as the Flight IIAs today. Whether or not we need to do something to make that more, and how that would affect ship design in the next ten years, is a question of ongoing discussion, both in the requirements side in OPNAV, and the ship design side in NAVSEA. What are we really going to need, and what does that mean for ship design? That’s the next step. The Flight III tasking was to get AMDR on and give it the same cooling and power growth potential. Don’t take a step back from the Flight IIA today. I could have put AMDR on Flight III and eaten all the growth, and you would have had a ship with no growth margin. We looked at that extensively because it was the lowest cost option, and discarded that as not responsible. We are going to want to keep these ships around, so keep what we have today as far as margins, and that gave us a certain design and philosophy. I think you will see CNO staff and NAVSEA work together on other concepts of what will we do to grow that some more. But that is the next generation after this Flight III. That will be my relief’s concern to tackle. What can you tell us about the process behind the Future Surface Combatant Study? If you look at the way the DoD formulates future requirements, it is called the JCIDS process, the joint capabilities integration and development system, it starts with an analysis, an FCA, a future capabilities analysis. The organization that thinks they might have a future gap, must first analyze what capabilities in a given time frame does a given force structure need to be able to address. From the result of that you write an initial capabilities document and you address an analysis of alternatives. Where we are in that process now is that N96 is running that future capabilities analysis, that is going on now. That is really a requirements evolution, it is not really a technical or acquisition evolution so that is not mine to run. N96 wanted to be very participative so they have got a team doing it. The team has regular meetings with a couple of oversight councils, one at the captain’s level and one at the flag level. N96 invited a slew of practitioners across the spectrum of operators, acquisition, technical, and budget to get regular briefings on what the teams were doing and get feedback. They thought I was one of the practitioners and I have sat in those meetings. I have seen the work they are doing, and they are doing good work. They are looking out into the future and asking what kind of capabilities will the surface Navy need to contribute to the force in the 2030s, 2040s, and what are we doing today and what modifications do we think we need to make in order to meet those future needs. Those are the questions they are trying to answer. 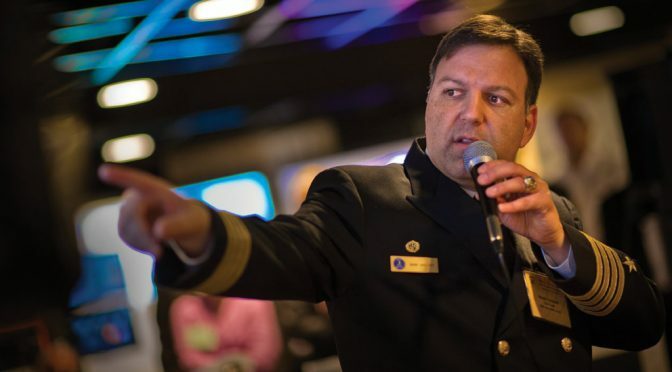 The question that comes after is more of an acquisition question of which I would expect, both the PEOs (Program Executive Officers) and NAVSEA to be more involved in, and that is the analysis of alternatives. Now that you have told us these are the things you need us to do, what are some of the different ways of doing it, and let’s determine which of those ways might do it best, which ways can do it most affordably. But the future capabilities analysis is where they are at now. What best practices and lessons learned from the DDG 51 program should inform the Future Surface Combatant Study? I would put those into two different categories. 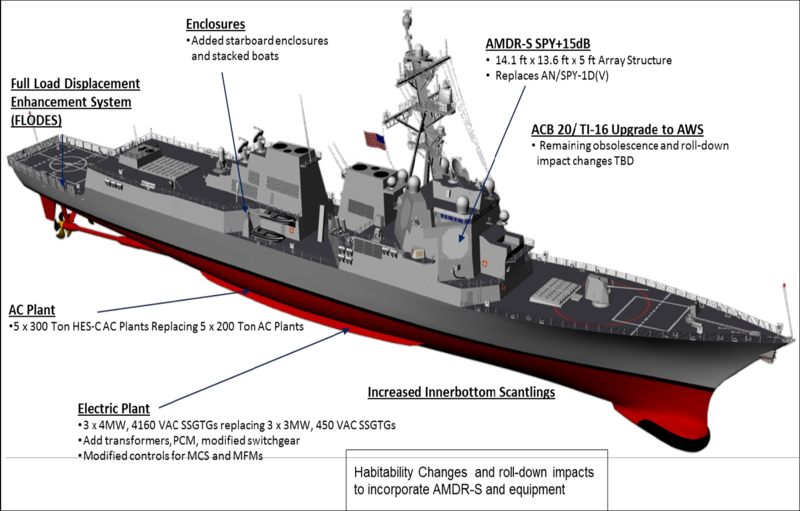 The DDG 51 program has been successful from a technical standpoint and from an acquisition standpoint. From a technical standpoint, the DDG 51, from its inception, was designed to be flexible, redundant, and survivable. We have proven this, look at the Cole. The ships have taken battle damage and lived to fight another day. The ships have been flexible enough that they were designed in the 1980s and with modification, and sometimes significant modification, could be made combat relevant in the 2020s. The systems engineering of both the design of the ship, and especially the systems engineering that went into the design of the combat system, is good solid systems engineering discipline. Know your requirements, break them down, formulate them, and integrate the pieces back together to provide an end-to-end capability. To give you an idea, I want to be able to shoot down an air target at a certain distance that is moving a certain speed with a certain level of maneuver. The systems engineer asks how do I design that kill chain? How do I break that down? What capability do I want in the missile, radar, and illuminator? What parts of that kill chain are going to produce which effects in order to get the end effect that you want? 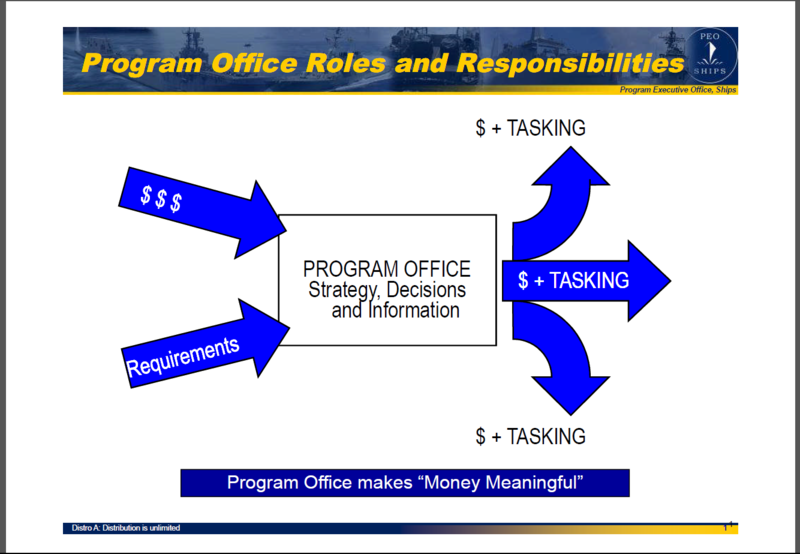 From its earliest days back when Wayne E. Meyer had the Aegis program, that has always been a disciplined engineering process. Whether you are talking about the ship’s survivability, mobility, or the ship’s combat capability, that has been a disciplined technical process. That is good for anyone building ships, or anyone building anything, that mind and that process. On the acquisition side, there are several things I would want a future shipbuilding program to look back at the DDG 51 program and extract. The first one is a real careful, facts-based decision on what parts of the ship were we going to have the shipbuilder do, and what parts would we contract separately where the government contracts GFE (government furnished equipment) and delivers separately to the ship. There have been times when it has been thought advantageous to go one way or another with that pendulum. Because there is a certain attractiveness, we could have the Navy buy everything and just have the shipbuilder assemble everything. That’s got problems. You can give the shipbuilder the performance spec for the ship and let the shipbuilder buy everything. That’s got problems. You have different problems both ways. The Aegis program, and especially DDG 51, has always been a point in the middle, and very carefully thought out. What do we want the shipbuilder to buy because we want them to be responsible for it, because it is within their wheelhouse and capability. This could be an engine, generator, or a fire pump. Alternatively, this is not in their wheelhouse, it is not within their capability, and frankly I want control over it like a sonar, radar, or a missile launcher. Those were thought out decisions in the DDG 51 and I have changed some of them during my time as Program Manager in both directions. Times change, industry changes, but we don’t make those changes lightly, and we make them only after a very long analysis of thinking about the capability we are trying to get, and what is the best way to materialize it. We carefully think through what makes sense to contract directly for, what makes sense to contract out, that is called a make-buy, or the GFE/CFE divide. That is one thing I would have a future program look at DDG 51, and the way they made their decisions. Not that a future program would make all the same decisions, ten years from now industry might change and the requirements might change. They might make a different decision, but the process we used to make that decision was fundamentally sound. The other thing that has always been key in our program is maximizing competition between the shipbuilders, using profit-related offer, at the sub-tier vendors, and using competition wherever it was possible and practical to get competition. Competition gives you good results in acquisition. From between having a good make-buy plan, and using competition as much as you practically can, marry those together and that provides a good foundation for any future acquisition program. In Part Two, CAPT Vandroff goes into depth on his publications Confessions of a Major Program Manager published in U.S. Naval Institute Proceedings, and an Acquisition System to Enable American Seapower, published on USNI News and coauthored with Bryan McGrath. He finishes with his thoughts on building acquisition expertise in the military and his reading recommendations. Read Part Two here. Featured Image: CRYSTAL CITY, Va. (Jan. 12, 2012) Capt. Mark Vandroff, program manager for the DDG 51-Class Shipbuilding at PEO SHIPS, discusses new technology with guests and media during the 24th Annual Surface Navy Association Symposium. (U.S. Navy photo by Mass Communication Specialist 2nd Class Todd Frantom/Released).